Ed Carleton (centre) was a guest coach at Saskatchewan Roughriders training camp. Ed Carleton went back to school this month, but he didn’t have to travel very far. The long-time assistant coach and defensive co-ordinator with the University of Saskatchewan Huskies football team has spent the past three weeks picking up more tricks of the trade as a guest coach at Saskatchewan Roughriders training camp, which wraps up Thursday on campus at Griffiths Stadium in PotashCorp Park. For Carleton, it’s been a valuable learning experience working with a new Roughriders coaching staff, a crash-course of training and technique tips and practice plans and preparation that he can take back to help the Huskies program. “That is why as coaches we do all the clinics and these kinds of things, to see what you can pick up,” said Carleton, a 50-year-old native of Swift Current who earned an education degree from the U of S back in 1989 and has spent the past 23 seasons helping coach Huskies football. 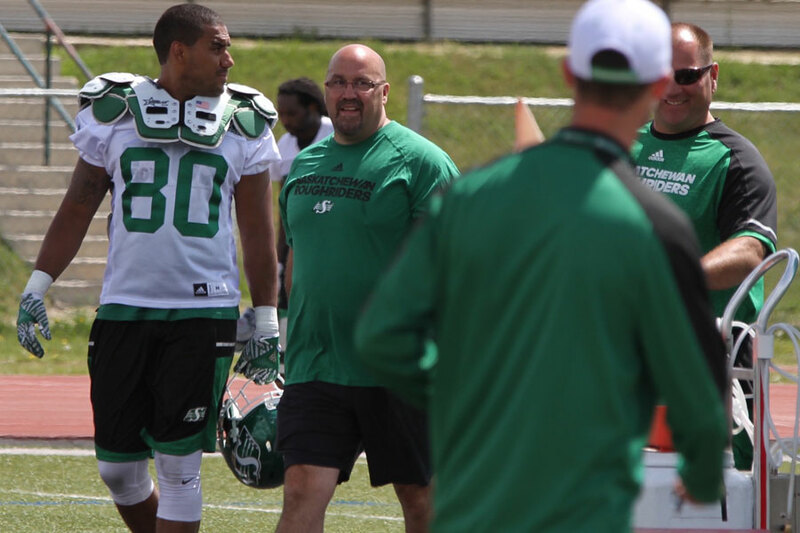 This is the fifth Canadian Football League training camp that Carleton has worked at as a guest coach, with previous stints with the Roughriders as well as the Calgary Stampeders and Winnipeg Blue Bombers. In each camp, Carleton has been an active part of the coaching staff, working drills alongside the full-time staff. Carleton takes special pride in watching former Huskie players move on to the professional ranks, with U of S products Levi Steinhauer and Tim Agbaje currently trying to crack the Roughriders’ roster again this season. The 25-year-old Steinhauer is a special-teams standout for the Riders and has also been moved from defensive end to fullback for his fourth season with the team, while the 26-year-old Agbaje is preparing for his second year of duty on the defensive line with the Roughriders. The Roughriders wrap up their three-week stint at the U of S with one final practice at Griffiths Stadium on Thursday starting at 9 am, before travelling to Edmonton on Friday to play their final CFL pre-season game on Saturday afternoon versus the Eskimos. Setters CJ Gavlas and Derek Epp of the U of S men’s volleyball team have been named to Canada’s junior men’s squad that will compete in the U21 NORCECA Continental Championship from July 5-10 in Quebec. Former Huskies power hitter Gavin Schmitt will lead the national men’s volleyball team team in FIVB Men’s World League action in Saskatoon from June 24-26, as Canada gears up for the the Summer Olympic Games in Rio de Janeiro, Brazil from Aug. 5-21. Other former Huskies heading to the Olympics include wrestler Jillian Gallays, shot putter Taryn Suttie and wheelchair basketball player Erica Gavel, while U of S women’s basketball coach Lisa Thomaidis will coach the Canadian team. Huskies all-Canadian guard Laura Dally is one of 24 players still battling for 12 roster spots on the Olympic squad.